P Steinmann et al. The face of multiparasitism: which helminths are commonly found together? S Attwood et al. Studies on the parasitology, phylogeography, and the evolution of hostparasite infections, for the snail intermediate hosts of medically important trematode genera in Southeast Asia. YL Wang et al. Advances in metabolic profiling of experimental Nematode and Trematode infections. This thematic volume provides authoritative, up-to-date reviews pertaining to the epidemiology, public health significance and shifts therein, control (current activities, successes, setbacks), persisting challenges (e.g. sanitation, universal coverage of health services, health-related behavior) of the key parasitic diseases in Southeast Asia. 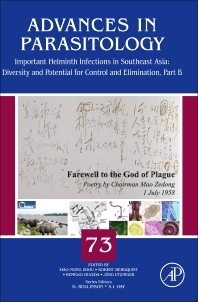 The book also discusses the new tools and approaches for enhanced discovery and control of helminthic diseases. Professor Xiao-Nong Zhou is Director of the National Institute of Parasitic Diseases at the Chinese Center for Disease Control and Prevention, Shanghai, P.R.China. He graduated with a PhD in Biology from Copenhagen University, Denmark. His professional works are across the fields of ecology, population biology, epidemiology, and malacology. Professor Zhou is the Chair of the National Expert Advisory Committee on schistosomiasis and other parasitic diseases for China’s National Health and Family Planning Commission. He has written extensively on parasitology and parasitic diseases, with more than 100 peer review publications in international journals, such as N Engl J Med, Lancet, Emerg Inf Dis, Inter J Parasitol, Adv Parasitol, PLoS NTDs, Parasites and Vectors, etc. He has collaborated with WHO/TDR and WHO, including serving as members for WHO STAC on NTDs, WHO/TDR STAC, WHO Foodborne Burden Epidemiology Reference Group. He had contributed, as former President, to the Regional Network on Asian Schistosomiasis and Other Important Zoonoses since 2000. He is the Editor-in-Chief for Infectious Diseases of Poverty (BioMed Central as publisher), and Chinese Journal of Schistosomiasis Control (Chinese national journal).